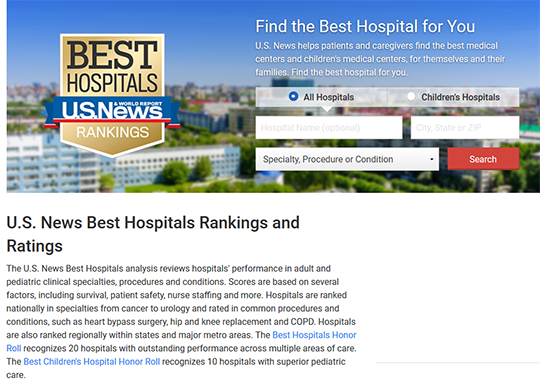 The U.S. News Best Hospitals analysis reviews hospitals’ performance in clinical specialties, procedures and conditions. Scores are based on several factors, including survival, patient safety, nurse staffing and more. Hospitals are ranked nationally in specialties from cancer to urology and rated in common procedures and conditions, such as heart bypass surgery, hip and knee replacement and COPD. Hospitals are also ranked regionally within states and major metro areas. U.S. News profiles and evaluates every hospital in the American Hospital Association’s Annual Survey Database.